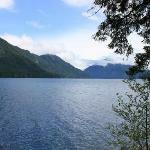 We stayed at Fairholm campground at the west end of Lake Crescent in July for 4 days ($12/night). The park was wonderful and the lake was beautiful. We had some AWFUL neighboring campers who were really loud and foul mouthed the first night we were there. After speaking with the park ranger, we didn't have any problems the rest of the nights. Another downfall was that the boy's bathroom had feces all over the toilets. My husband (what an amazing man) went in and cleaned it up so our kids could use the restroom. If you go, be sure to bring sanitizing wipes! 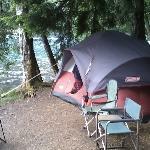 This campground has lots of trails and is in a very wooded area. Lot's of mosquitos! Ground is pretty rocky, so be sure to bring a tarp for under your tent! If you get there early enough to get a lake spot, you won't regret it! The lake was very cold, but that didn't stop our kids from wading and having a great time. We saw people fishing from the dock and they had Kayak rentals for 20$/hr. The camp store was a bit pricey, but had a little bit of everything in stock for campers who forgot something. 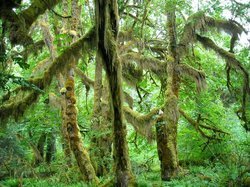 We ended up going to the Sol Duc Springs and swam for the day (less than 20minutes away). Our kids enjoyed going to the springs as much as we did. It was 9-12$/person for the whole day. They...We stayed at Fairholm campground at the west end of Lake Crescent in July for 4 days ($12/night). The park was wonderful and the lake was beautiful. We had some AWFUL neighboring campers who were really loud and foul mouthed the first night we were there. After speaking with the park ranger, we didn't have any problems the rest of the nights. Another downfall was that the boy's bathroom had feces all over the toilets. My husband (what an amazing man) went in and cleaned it up so our kids could use the restroom. If you go, be sure to bring sanitizing wipes! 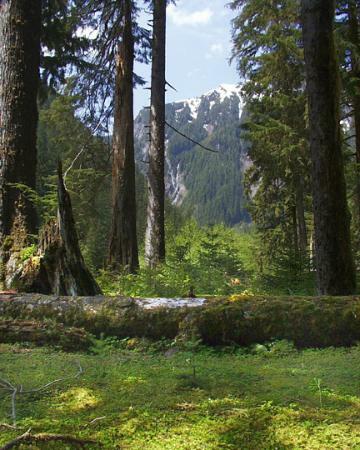 This campground has lots of trails and is in a very wooded area. Lot's of mosquitos! Ground is pretty rocky, so be sure to bring a tarp for under your tent! If you get there early enough to get a lake spot, you won't regret it! The lake was very cold, but that didn't stop our kids from wading and having a great time. We saw people fishing from the dock and they had Kayak rentals for 20$/hr. The camp store was a bit pricey, but had a little bit of everything in stock for campers who forgot something. 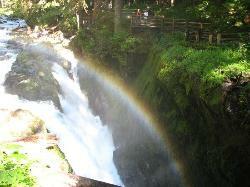 We ended up going to the Sol Duc Springs and swam for the day (less than 20minutes away). Our kids enjoyed going to the springs as much as we did. It was 9-12$/person for the whole day. They have 3 smaller pools and a large swimming pool with a deep end. Though they did have life guards, it seemed like the ratio of swimmer to lifeguard was really high- so be a good parent and watch your own kid! Note: you will have to purchase a day pass from the park ranger prior to arriving at the springs ($15 to $30). 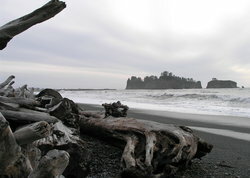 We also drove about 1/2 hr to visit La Push and then drove about 1 hour to the tip of WA. The views and beaches were worth every minute of the drive. Our kids (ages 5 - 15) enjoyed the mini hikes and playing at the ocean. Get a good book, sit in a Adirondack chair! Wow, this is the life. Mother Nature at it's best! Don't go if you don't want a laid back stress free vacation. If you are in to lots of activities not your place. The water is unbelievably blue and the scenery is just stunning. A drive around this lake will also provide views of rainforest scenery, complete with moss-covered picnic tables! Bring a picnic lunch and stop at the little roadside park and enjoy. Our entire family agreed it was the coolest place to stay. Park Ranger gave a talk in the evening with a bon fire and we all loved it. View is unbelieable. Loaded with history and fun activities. Loved Lake Crescent!! 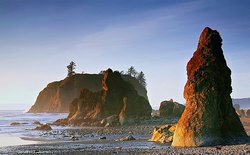 We drove by it several times during our stay in the Pacific Northwest and I fell in love with the views, the water, everything about it. 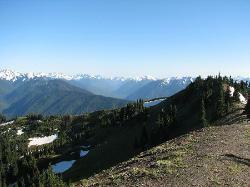 One of the things we did was the hike to Marymere Falls which start at the Storm King Ranger Station on Lake Crescent. There is a dock and boat launch there - perfect place to hang out a little, take some pictures, and just enjoy the lake up close. I really think I could live there!! The most beautiful scenery on Hwy 101. If you've never been to Northern Italy or Scandinavia, this is what you'd see. Cold, clear water, blue mountains edging the lake that seems to go on forever. It's magnificent!